I’ve been reading Tarot now for 33 years but it was only recently that I discovered the joy of multi-deck readings. I just adore the online people who shuffle and wait for cards to leap out to read them. They add extra decks to clarify messages as they have no structure to the placement of cards as they tumble to the table. I have done these readings but the interpretation is too simplistic. Reading the cards is all about interpretation of the card and its significance of position. Is it a past card? An incoming influence? A card of personal hope? All these things change the card’s story and weight. I do love the traditional Celtic Cross reading but I am interested in the way Madame Lenormand created the Grand Tableau reading. I like the crossing of lines and pathways but I’m also a big fan of cards covering cards. 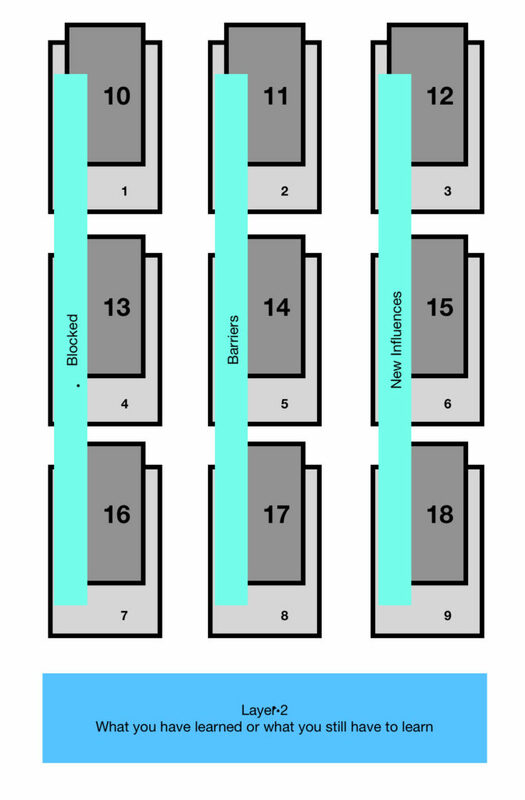 So I’ve developed a spread using three sets of 9 cards. It’s rather complicated but I feel a reading ought to be if it is going to delve deep enough into the psyche of the client. 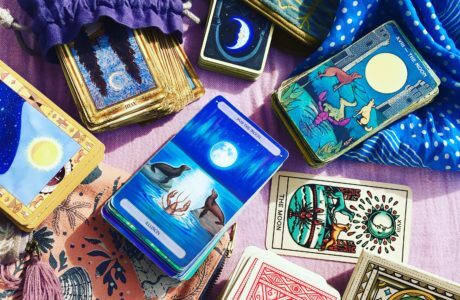 I begin with my Oceanic Tarot Deck by Jayne Wallace to set the foundation of the reading. All the cards in this reading do not use reversals. I might later but for now as I learn and develop this reading I need to keep it somewhat simple. The central card 5 is the most significant area and the main focus through which all the lessons will be illuminated as the layers grow. So the first three cards are current possibilities. 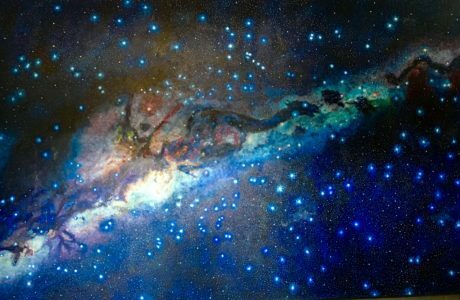 Foundations of energies and influences that are about to enter the querent’s life. 4, 5 & 6 are the keystones of three things from past lives that the querent is meant to remember to work through. 7, 8 & 9 are the foundations of current lessons that have been created in this lifetime. The cards are also read as columns too. So 1, 4 & 7 is the new possible energy entering to show how the past can be recognised and the lesson this has created in this life. 2, 5 & 8 is the same so the present. The thing the querent must work on now to help heal the past. 3, 6 & 9 is that lesson which will follow as the next part of their journey. Easy so far huh? Well strap yourselves in as it’s going to get a little hairy now as we cross every card with another. I’m using the Impressionist Deck here by Corrine Kenner & Arturo Pica. So now then this second layer of cards is all about where the querent is on their lesson pathway. The past is blocked as the print hurdles must be dealt with first. 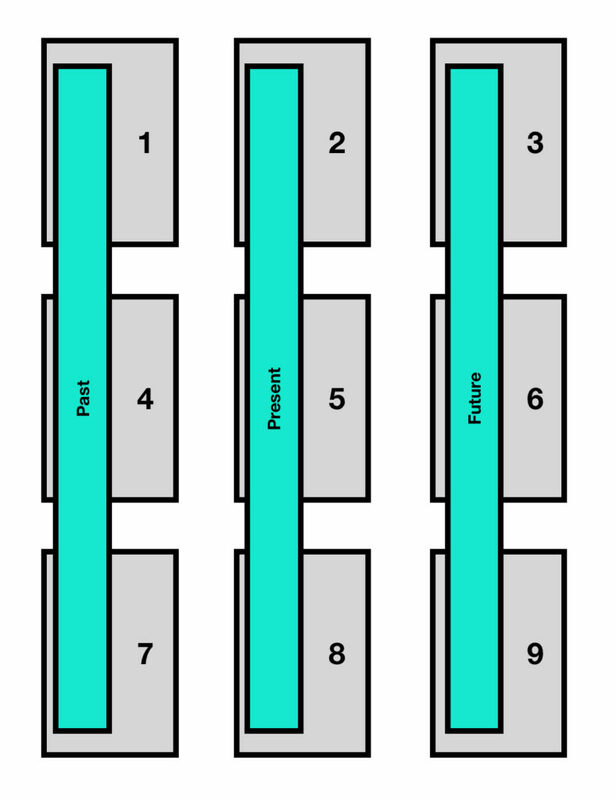 So read 2/11 – 5/14 – 8/17 first, remembering how the rows work. It is about interpreting where the querent is on the journey from the first deck to the second. What are they learning or what do they need to learn. 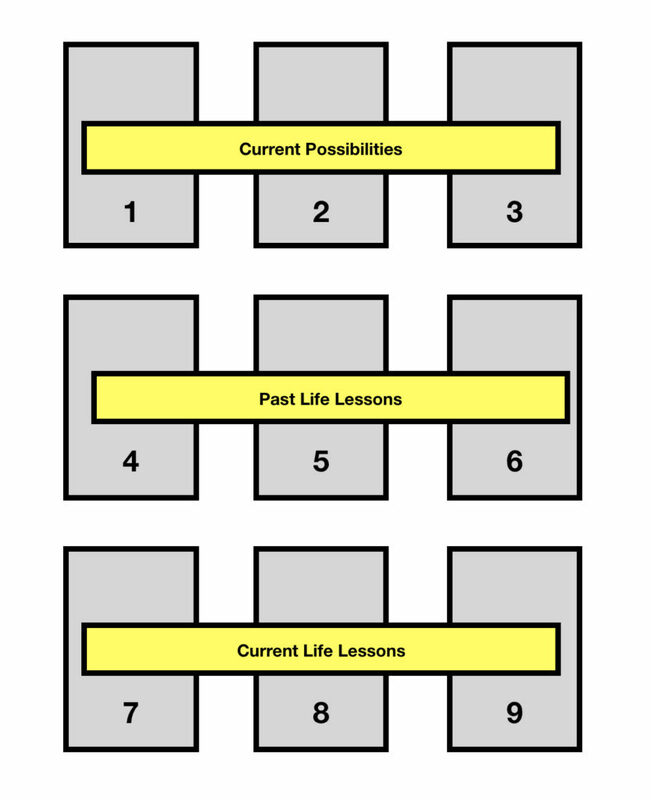 By lifting the present barriers they can then tackle the deeper older lessons of the first column. If they can journey through these older past life blockages then they will feel the flow of the new influences that will open up. This is like an onion. Stripping away layer by layer the complicated thoughts and lesson of the now to heal the past and start a new shiny future. Next it’s time to pick up the Lenormand Deck and ask for the answers to the unknown or unseen influences that will come to pass as the querent works through the 9 lessons to enlightenment. A small ask hahaha. So here we go. The time we read column ! first – Lessons. What unknown influences will help to unblock the most difficult lessons. Then this will reveal the unseen hopes from the middle column. And finally we see the possibilities for the future. 21, 24 & 27 are outcome cards if lessons are learned. 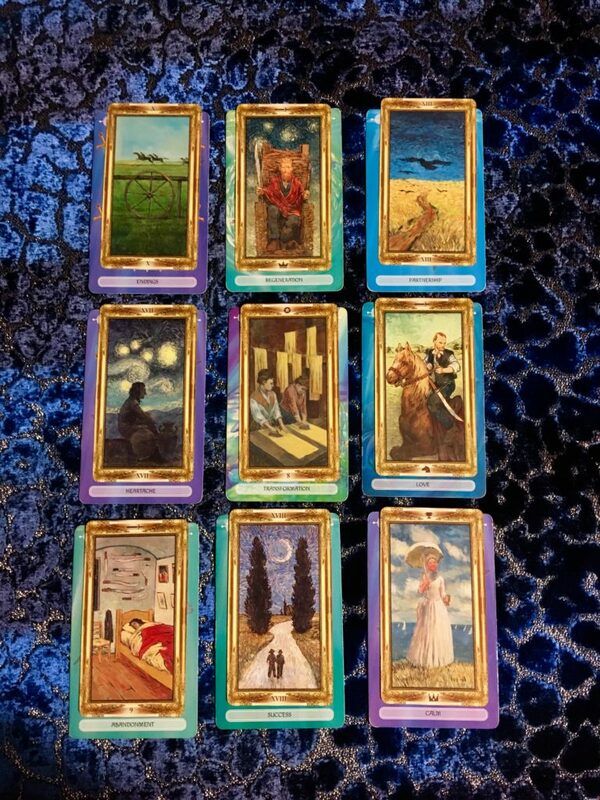 Lets look then at a sample reading and how we interpret the cards and their many messages. 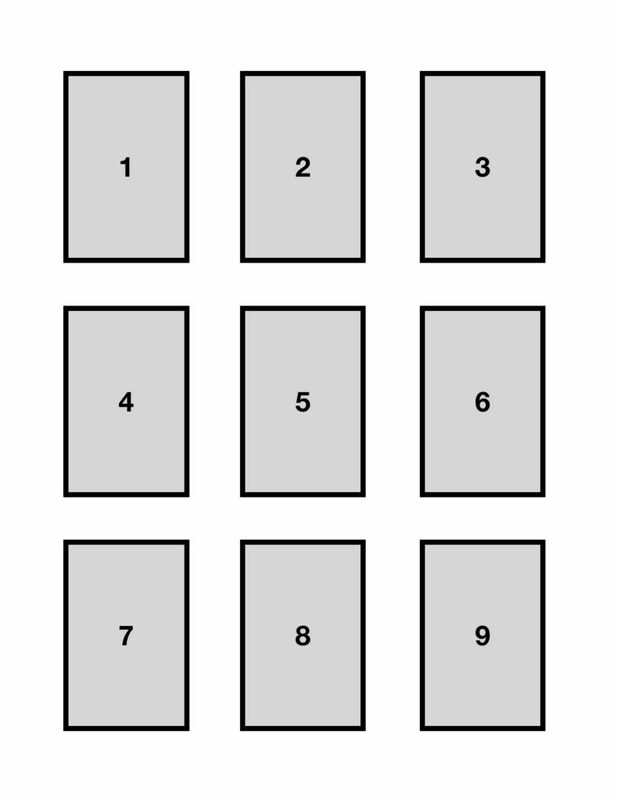 Beginning with row 1 at the top we see the basis of the current possibilities with the 10 of Swords – The World – Two of Cups (10+21+2=33 so 6 Harmony) Let go of the old and heal so you can feel connected to the world around you again. This beautiful card is often seen as unwanted but it is a necessary reminder to let go of something that now needs to be resigned to the past. An end. You have 10 blades with which to sever the ties that bind you to this old ideal. Release it. Be thankful for the karmic lesson and release yourself too. But to do this fully and move on you must release the past joyfully and without regrets no matter the hurt you have felt. It is time to begin anew. You could reached a Karmic goal and learn a huge lesson from this is the last card of the major arcana. Celebrate the achievement and be thankful for a lesson. Bask in divine light and seek out new opportunities to embrace as you move forward. It can also represent goals being achieve, papers to sign and contracts to be confirmed. But rest assured that you are to be rewarded for your efforts. It’s time to relax a little and play. It’s time to trust in the partnerships of others around you. Two heads and two hearts will be better than one and many heads and hearts will be better still. This card is about groups rather than just a soul mate. You will be rewarded in some way for your efforts to arrive at a new beginning. Celebrate what you have achieved this year and embrace the new and exciting passions offered to you soon. The middle row represents distant past life lessons that are playing out again to see if you can learn from them this time. Here the querent drew the Three of Swords – Death – Ace of Cups (3+13+1=17 so 8 Change) Heartache has caused immense pain and even death. Time to seek love that is secure. This is the tarot card of absolute heartache and pain. It has scarred your soul so much that you are repeating it over and over again. You have endured it too many times and now it is time to let go of it. Wake up and see that love that hurts is not love at all but an illusion you keep creating. This lifetime you have a chance to fix it. The Death card in a past life reading actually refers to the transformation from one life to the next. The passing of the soul into another vessel and yet repeating the same errors again and again.Loving the wrong people and being hurt. Not transforming during a lifetime to understand true love and happiness. This card is all about the heart getting its desires. So whatever it is that your heart most wants, open yourself to the energy and let your dream flow into your soul through your heart chakra. This will be either a creative endeavour or the beginning of a new passion. Love is the core to nourishing your soul and you are about to shine with passion. The bottom row represents the lessons that the querent has created from this life alone through their actions. These lessons if not solved during this life cycle will be added to the pot of past life lessons to resolve in another life yet to come. Here the querent drew Five of Pentacles – Six of Wands – Six of Swords 5+6+6=17 or 8 Change. Abandonment has caused worry that is stopping their success and achieving calm. This card at first glance appears to be rather sad but isn’t. The Five of Coins is the fear of not being included. A deep seated fear within a distant part of your psyche. You worry too much about being totally alone but also not having enough money or losing a job. Don’t. This card tells you all is not lost but that you must engage with ensuring that you are needed. Change your thought patterns. Widen your social network and ensure others see your value. Brilliant victories and successes are due you but you remain blocked to them. You have worked hard and still wait for others to see the shining light that is surrounding you. This should be your time to shine yet you’re holding back. Be ready to accept all the wonders that should be coming to you. Financial rewards are promised too but you must lift the blockage. You are promised a life of calm satisfaction. All the conflict and upheaval you have suffered it meant to have dissolved away. Yet you cannot lift the rock that stands before you. Nor can you seem to walk around it. It is time to release the crap and step forwards into the flow of calm and gentle energy. As we look down the columns we get insights into how the new possible energies are to help process the recent past in this life that is a lesson from the past. This really is a lesson that you know to have happened and you really need to finish with. 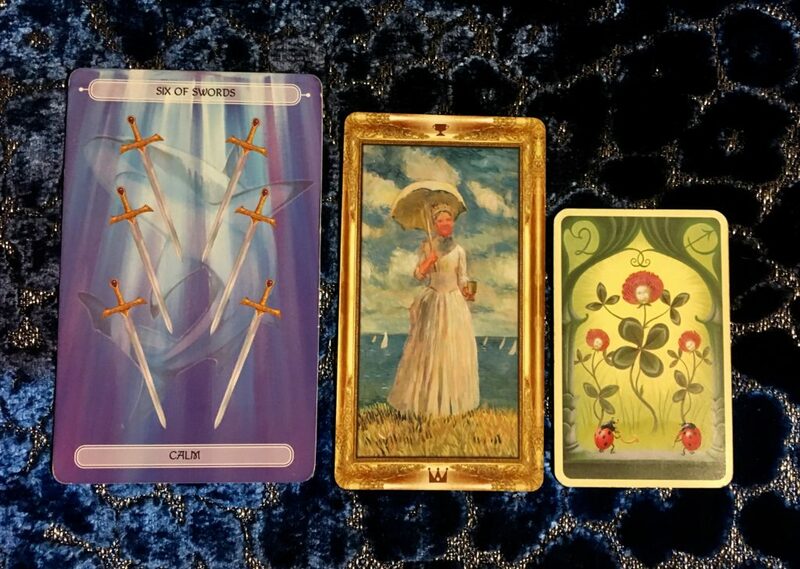 Ten of Swords – Three of Swords – Five of Coins 10+3+5=18 or 9 Intensity. 9 is a near completion number. The energy of endings must be applied to the old scars of heartache that you keep experiencing life after life. Do not allow the energy of abandonment to rule your future. See the pain for what it truly is. 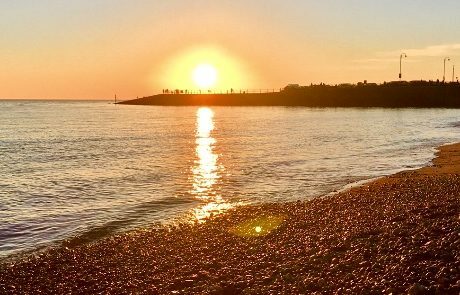 A current lesson from a past life that you are playing out again so you might learn to rebuild your heart again and fill it back up with love. You’ve almost got this one. Let it finally go. This middle column is read the same way but this time the lesson is current but still from the past but affecting you right now. 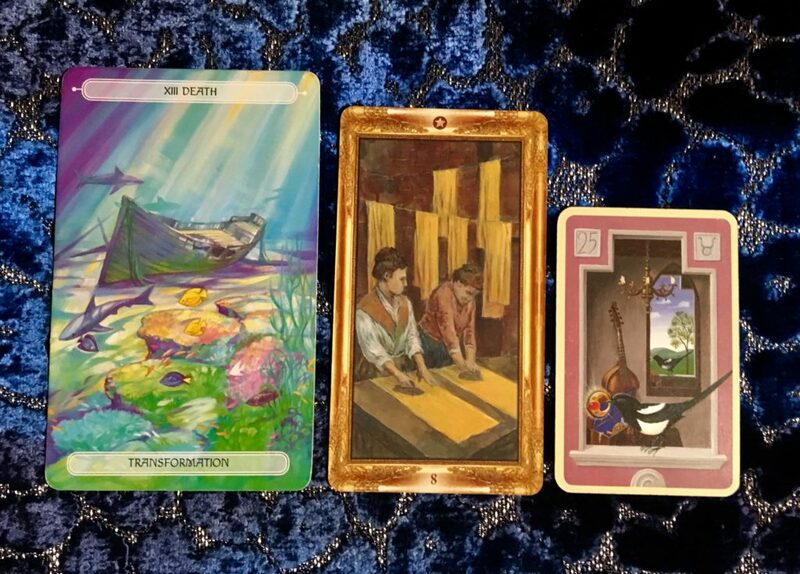 The World – Death – Six of Wands 21+13+6=40 or 4 Stillness. Allow the completion of the lesson from Row 1 to dissolve so that the World can bring in the energy of regeneration. 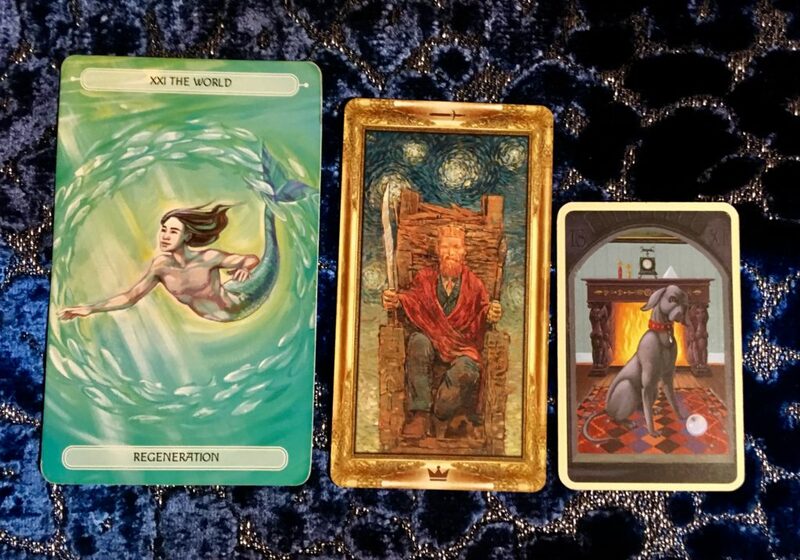 The World is the final major arcana card and it’s energy will allow you to transform your entire life into something new which will allow you to lift the veil on your blocked future successes. This third column is the next lesson that you are about to embark upon completing. It is a lesson that started and blocked but you will be given the chance to fix it and release it. 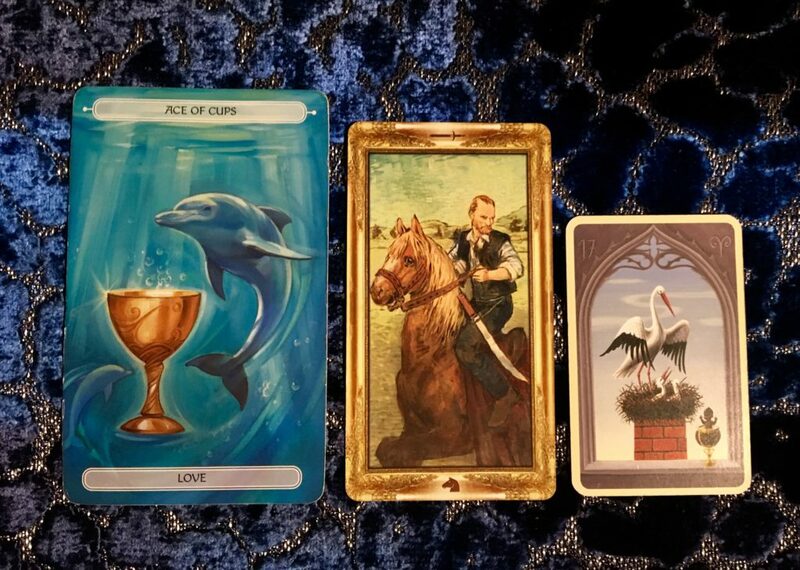 Two of Cups – Ace of Cups – Six of Swords 2+1+6=9 Intensity. By completing the transformation of the second row you will be able to allow the energy of love and partnerships enter the frame of your existence. This will then bring new creative thoughts and also a new partnership in both business and love. This will then allow you to feel the immense calm that finding your place in life can bring. Lets now draw the second layer and look at how we read those. 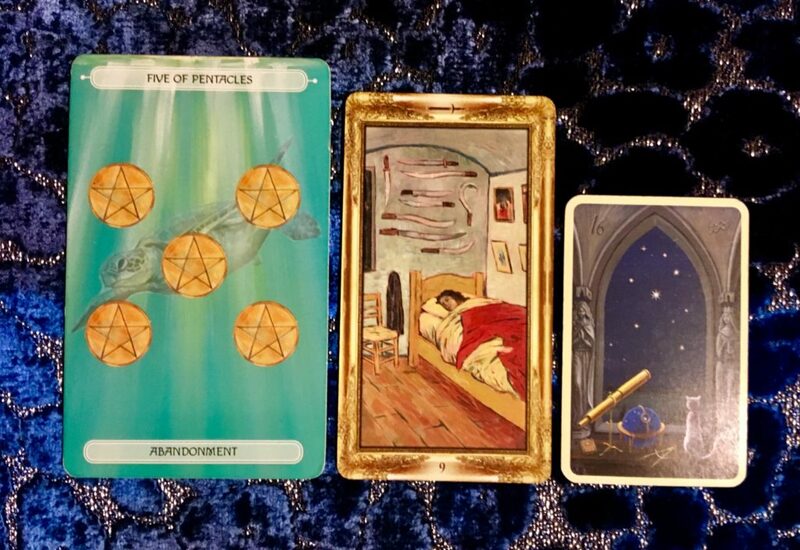 These cards are the places within the lessons that we are at or that we need to achieve to move on. There is little need now to read the rows. Concentrate on the columns. I call this column ‘Blocked’ as it is the first energy from the past that needs to be lifted first and it is a very stubborn old energy from many many past lives. Wheel of Destiny – The Star – Nine of Swords 10+17+9=36 so 9 Intensity. The Wheel of Destiny is over the Ten of Swords suggesting that it is a karmic destiny to bring about the ending of this lesson. The querent must observe this lesson to move forward. 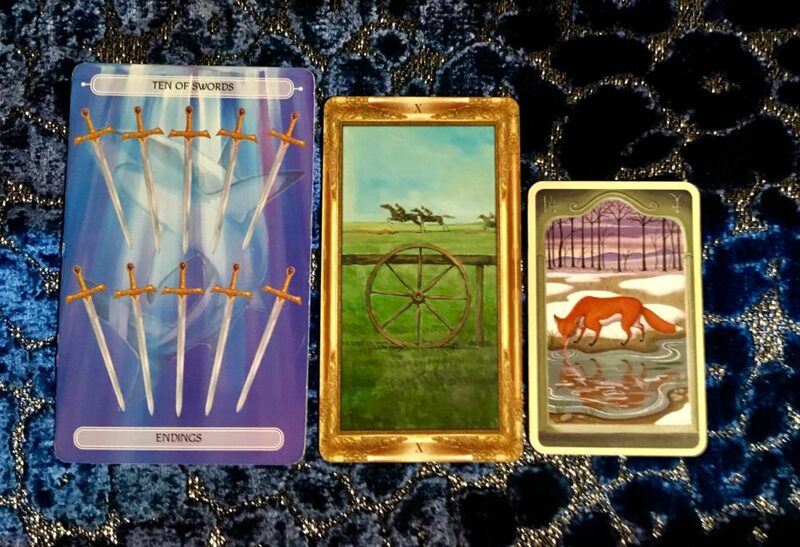 The Star offering hope sits over the Three of Swords suggesting that there is much to look forward to if the querent can release the connection of pain in the heart. It is the pattern of repeating the ache that is blocking the querent from moving to a better pattern. The Nine of Swords over the Five of Coins show that the querent is still experiencing nightmares and anxiety. It is time to create a new thought process that is more positive. To do this the querent must correct the bad thought pattern every time it floats into the head. This column is the present ‘Barrier’ column. 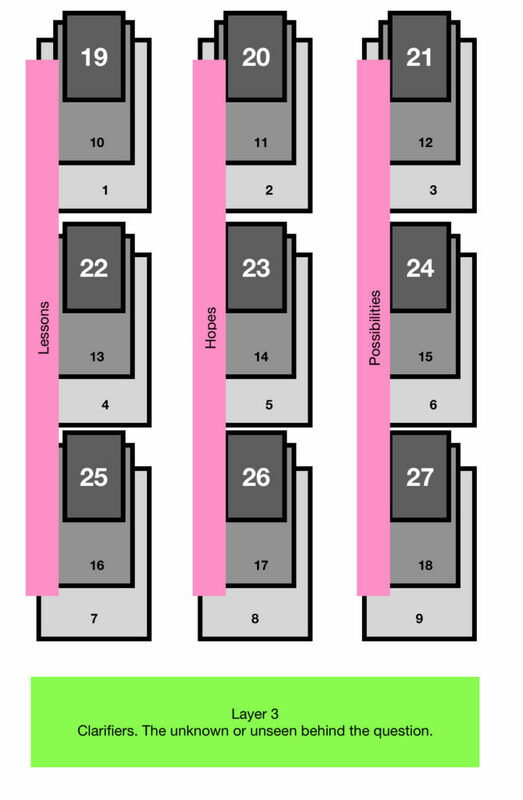 This is the current lesson that will pass once the lesson of the first column is rested and released. So here we see the King of Swords – Eight of Pentacles – The Moon 14+8+18=40 or 4 Stillness. This King is the double air sign monarch acting as a barrier to the World card. He slices through nonsense to clarify any situation and he does this swiftly. He hints at the querent’s inherent skills and knowledge if only applied to the regenerative transformation to success. The Eight of Coins over Death advices that the querent’s eventual success lies in hard work but that rewards will be possible. 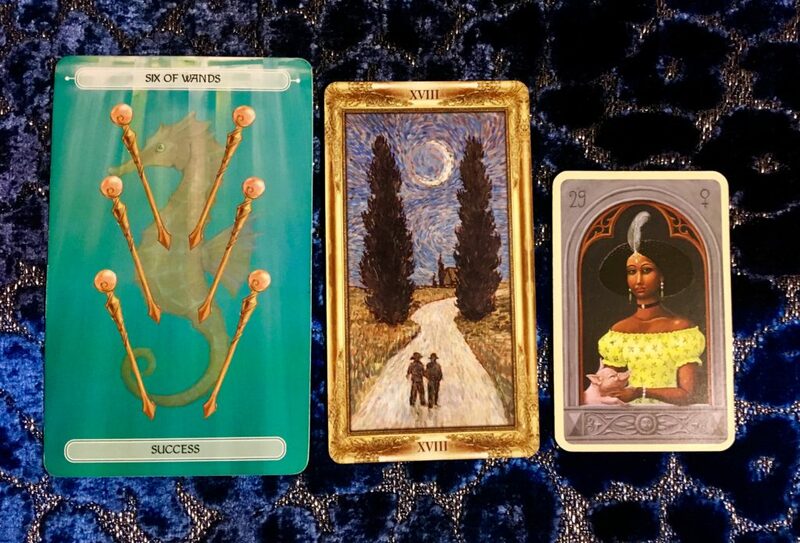 The Moon over the Six of Wands foretells how the eventual successes that the querent can gain will lead to a wonderful expansion of their spirituality. They must remember to reflect on the eventual successes and remember what it took to achieve their goals. This will keep them grounded. That is the lesson of success. To watch the ego doesn’t destroy their gains. This final column is the future influences and the future lessons. Here the querent drew Death – Knight of Swords – Queen of Cups 13+12+13=38 or 11 The Healer. Eleven is a master number of enormous power and hope. It is the root of all other master numbers too. Thus is a signal of the outcome the querent can expect if the spiritual journey in this life is observed and acted upon fully. 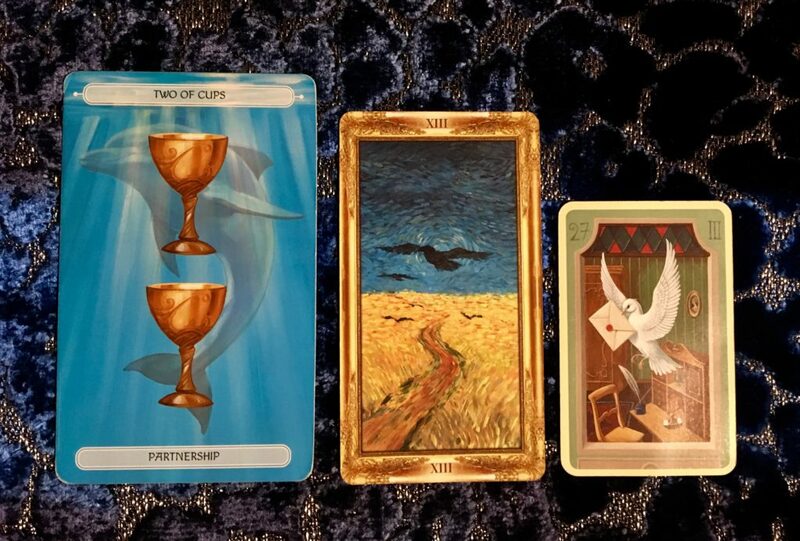 Death over the Two of Cups speaker of a yet future transformation the querent must enact to let the power energy of love and partnerships enter their present flow. The Knight of Swords over the Ace of Cups is about new romance like nothing you have experienced before. This is about a youthful renaissance and about falling in love like a teenager all over again but with wisdom this time. The life lesson here is to ride out with vigour and sharpen the mind to reap the rewards of a burning passionate love. The Knight of swords is pure fire and lust. The Queen of Cups over the Six of Swords is a lesson in sensitivity bringing calm joy and loving happiness to the querent. This union is about nurturing each other with a healing passion. Exciting news if the querent can break the old bad ways and find the new energies on offer. Finally. Yes there’s one more set of 9 cards to come. 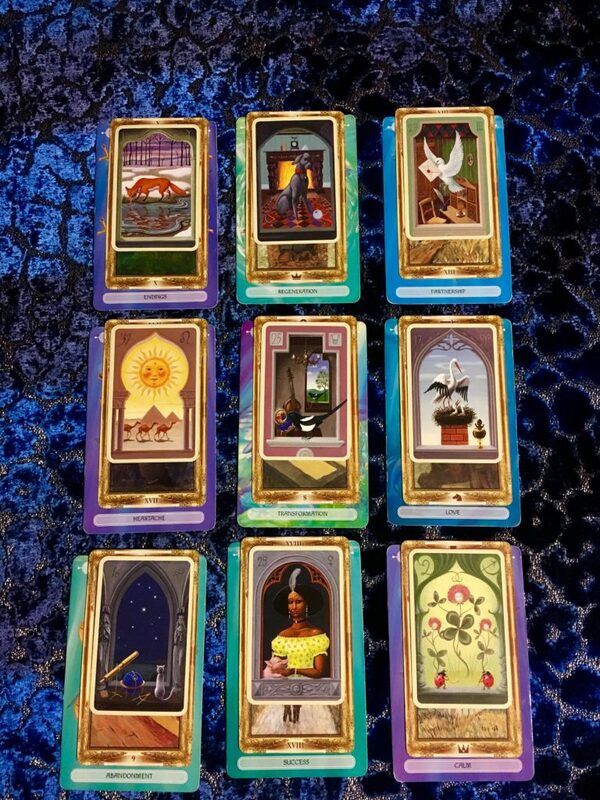 These are the Lenormand cards and they represent unknown or unseen influences that will arise to aid the querent. Or are the eventual outcomes to the blocked lesson to be learnt. Fox – Sun – Stars 14+31+16=61 or 7 Potential. So the total of the three layers is 9+9+7=25 or 7 Potential. This is because the first blocked past lesson is full of potential that will lead on to the next lesson. The energies entering the querent life suggest completion of the lesson is within reach. Here we have the ‘Endings’ lesson with 10+10+14=34 or 7 Potential. With the ending of a cycle through destiny self preservation will prevail. This card is often seen as sly and cunning but I do not see fox that way. Fox is an adaptable creature who can make a home wherever they find themselves. Cunning is a self-preservation skill and is an important strength. Fox is about taking care of yourself. Here we have the ‘Heartache’ lesson with 3+17+31=51 or 6 Harmony. From pain will come happiness and joy. The Sun is the luckiest and happiest card in the Lenormand deck and tells of guaranteed joy and optimism. This card is the positive outcome to any question. The pain will lift and the heart will open again. Here we have the ‘Abandonment’ lesson. 5+9+16=30 or 3 Activity. By facing the triple lessons for the past the Universe will offer a wish. This is the wish-fulfilment card of the Lenormand deck. Reach for the stars and they will grant you more than you hoped for. This card speaks of sublime energies flowing towards you. 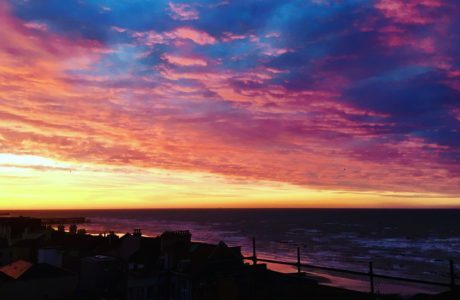 Awe inspiring wonders are on offer to you. All you need to do is truly let go of the past pain and open yourself up to the new transcendent gifts that are being offered to you right now. Dream them and ask the stars to deliver them. Dog – Ring – Woman 18+25+29=72 or 9 Intensity. So the total of the three layers is 4+4+9=17 or 8 Change. This is the message of the present. The central card of the first Oceanic deck is Death. Transformation. Change. Only through change will progress to the future be achieved. This is the ‘Regeneration’ lesson. 21+14+18=53 or 8 Change. This is a lesson in learning to trust others again after the pain of the ‘Heartache’ of column 1. Dog is about trust and someone offering kindness. It is about learning to trust in other again. Dog offers unquestionable love and loyalty but the lesson is to accept this love with an open heart again. This is the ‘Death’ Lesson 13+8+25=46 or 1 New Beginnings. This is about transforming and here the Ring card hints at a connection with someone that will help the querent move forward. The ring is often about engagements and marriage but here it is about connections. This ring is the union of commonality. 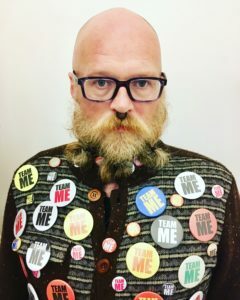 The desire to reach out and connect with someone or something. It can also serve as a warning to break free from any unhealthy attachments. Learn to trust that the Cosmos will support you and offer you all that you need to make this change and open yourself to better connections and better trusting and caring friends. This is the ‘Success’ lesson. 6+18+29=53 or 8 Change. The success that you seek will be helped to manifest by a woman. Woman like man in Lenormand is usually a personal signifier. But here in combination with dog and ring is shouts at a woman of significance who helps the querent to achieve the lesson. It is likely that an influential woman will offer help to the querent. The querent must learn to accept the help of the woman to succeed. This is not a lesson to be learnt alon. Hence the Woman card. Letter – Storks – Clover 27+17+2=43 or 7 Potential. So the total of the three layers is 9+11+7=27 or 9 Intensity. This leads to the final magic total of 7+8+9=24 or 6 Harmony. Now that is a wonderful overall number to end on. This is the ‘Partnership’ lesson. 2+13+27=42 or 6 Harmony. Through working with others a transformation can be achieved. The unseen element is a letter, email or text with great news for the querent. There is good news that may come in any form written or verbal but it will be extremely transformative for you. The lesson her is to accept the news graciously and with an open heart. It will allow a total transformative energy flow into your life. This is the ‘Love’ lesson. 1+12+17=30 or 3 Activity. This is the about returning to old things with a new heart. Storks are a card of migration and returning. It is about transformations and building a nest in more than one place. This is about the new love and passion due to the querent being across seas and in other countries. The new passionate union will likely be with someone of a different nationality. Or someone from far away. This is the ‘Calm’ lesson. 6+13+2=21 or 3 Activity. This outcome of finding a calmness though sensitive love between two souls is backed up by clover or luck. Clover a symbol of luck. Often in Lenormand readings it is seen a small passing luck but this underestimates the tenacity of clover as a plant. Clover is a bugger to be rid of in a lawn and so is good luck when it decides to favour you. Though the plant may be tiny it swathes hillsides and grasslands and the scent of the flowers when open are intensely aromatic and sweet. A favourite of bees too who use it to create clover honey. One of the sweetest honeys. Keep breathing in the good fortune to come and enjoy the ride. I hope you have enjoyed this very very long reading. 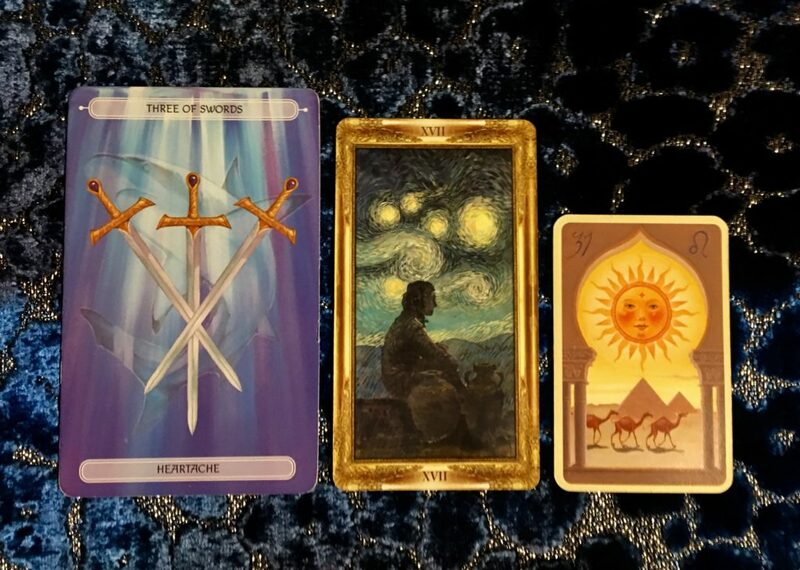 Obviously the querent in this case is myself and all the lessons I see in this reading are lessons I am trying to learn to achieve but even I find following the advice of the cards tricky at times. Correcting bad head habits and thought patterns that we carry from past lives can be extremely hard indeed. I finished this reading in hope that I can keep strong to positive patterns and not be doomed to repeat all these mistakes again in my next life but that I can achieve true happiness and fulfilment soon. 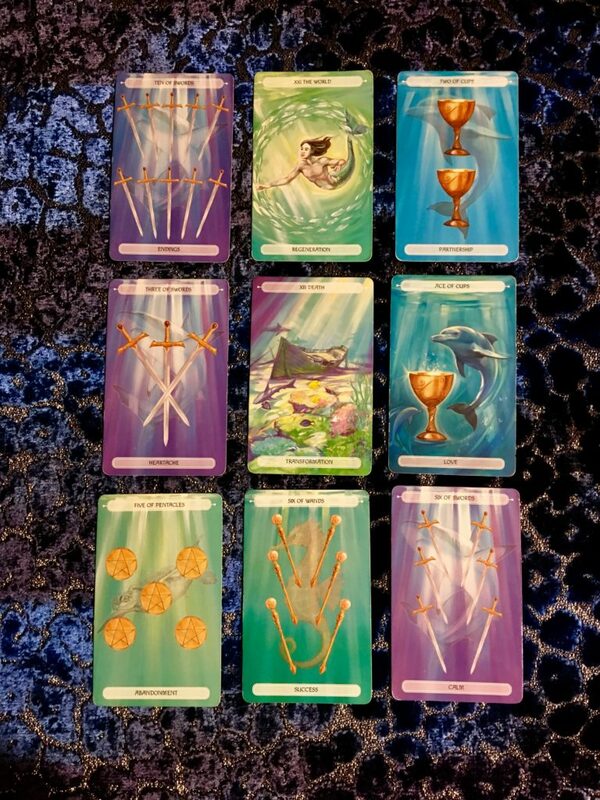 I hope you enjoy trying out this reading I’m calling ‘Nine Lessons and Barriers‘. It certainly offers detailed help and advice on how to survive life.